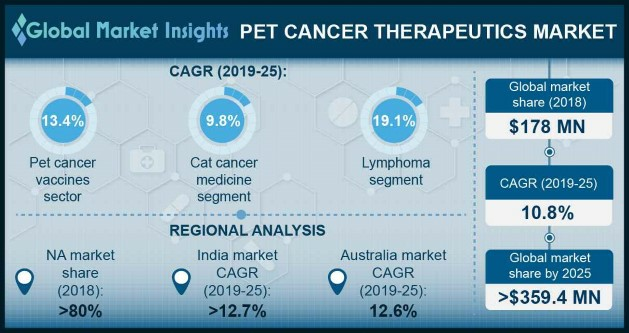 Pet Cancer Therapeutics Market size is set to exceed USD 359.4 million by 2025; according to a new research report by Global Market Insights. Growing pet adoption rate coupled with increasing disposable income of pet owners will drive pet cancer therapeutics market growth. Strong and robust drug pipeline for treatment of pet cancer will stimulate business growth over the forecast years. U.S. market is expected to reach USD 281.2 million by 2025. Presence of large number of pet drug manufacturing companies, quick adoption of innovative pet care medicines and increasing disposable income of pet owners will boost industry growth. Australia market is forecasted to grow at 12.6% CAGR across the forecast timeframe. High growth is due to growing pet-keeping trend, availability of innovative pet care medicines and increasing disposable income of pet owners.